As part of the St. Johns River Water Management District’s work to ensure adequate and sustainable water supplies are available to meet future needs while protecting the environment, the district prepares water supply plans per the provisions of Chapter 373, Florida Statutes. The water supply planning process is an open and public process, and includes local governments, public supply utilities, self-suppliers, other stakeholders and the public. Water supply plans identify future water supply needs for a 20 year planning horizon, and programs and projects needed to ensure sustainable supplies. The district is divided into three planning regions and is working with other water management districts on water supply planning in most regions. 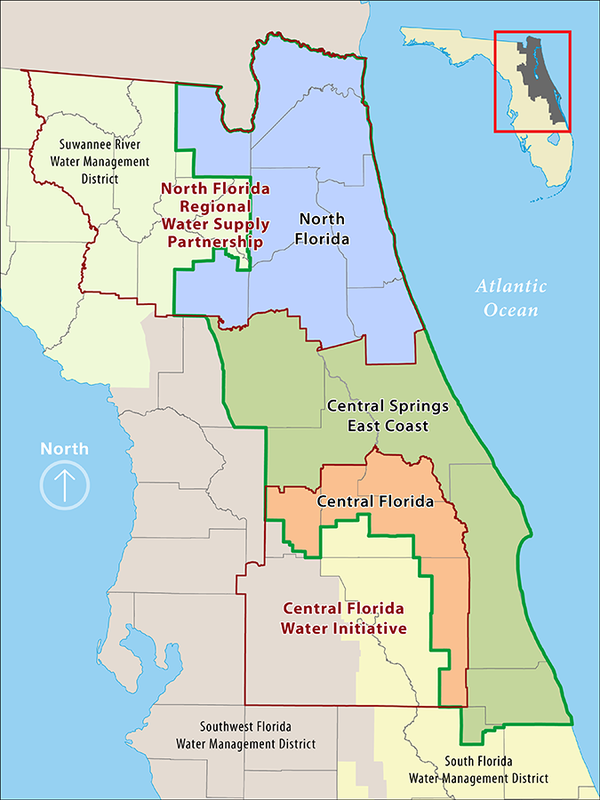 The St. Johns District has been working in partnership with the South Florida Water Management District, Southwest Florida Water Management District, DEP, Florida Department of Agriculture and Consumer Services, local utilities and other stakeholders in the central Florida area since 2013 to implement effective and consistent water resource planning, development and management through the Central Florida Water Initiative (CFWI). A joint, regional water supply plan was adopted in November 2015 by the three water management districts for the CFWI planning area of Orange, Osceola, Seminole and Polk counties and southern Lake County. Additional details are available on the CFWI website. The St. Johns District is working in partnership with local utilities, local communities, the Southwest and South Florida water management districts, DEP, the Withlacoochee Regional Water Supply Authority, and other stakeholders to implement a data-driven, proactive approach to ensure effective and consistent water resource and water supply planning and development for the Central Springs and East Coast Region. 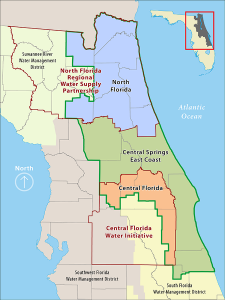 The Central Springs and East Coast Regional Water Supply Plan (CSEC RWSP) recognizes the unique local challenges and resource constraints facing the central region springs and coastal areas of the district. The planning region encompasses three sub-regions that include Marion and north Lake counties, Volusia County and Brevard, Indian River and Okeechobee counties. Current work includes intensive exploration and data collection efforts to understand the connection between the upper and lower Floridian aquifers, development of a regional water supply plan, identification of water supply and water resource development project options, continued emphasis on water conservation, and continued coordination with local governments, water suppliers and the public. The north Florida regional planning area covers 14 counties. The first-ever regional water supply plan for those north Florida counties was adopted in 2017 and was developed through a highly collaborative process among the Suwannee River and St. Johns River water management districts and the Florida Department of Environmental Protection (DEP), local governments, public supply utilities, environmental advocates and other stakeholders. Over a four-year period, the water supply planning process included 36 Stakeholder Advisory Committee (SAC) meetings, more than 50 other stakeholder meetings and two public workshops to engage stakeholders to understand their individual perspectives as related to water resource issues in north Florida. This plan is a direct result of the collaboration between these groups who each share the common goals of preserving and extending our future water supply.